Agree to Disagree or Agree to Assassinate? Today, as he continues to drop in the polls, he suggested that Americans wielding firearms take potential President Clinton's life. It wasn't even a funny joke. Posted in America, Current Events and tagged with Obama, trump, Donald Trump, Second amendment, gun control, Rally, Wilmington, guns, Assassinate, Clinton, North Carolina. August 9, 2016 by Bryant Manning. In a swarm of unlikely GOP candidates, Donald Trump caps it off by convincing almost a quarter of likely GOP voters that he's the one to go up against Hillary. There's already talk that if Rick Perry gets his way, Donald will personally fund his own third-party candidacy. This would likely rob Republican votes of a worthwhile GOP candidate and almost guarantee a win for the Democrats in two Novembers time. In a world where Fox News has warned its viewership of the plague of political correctness, it's not surprising that a straight-talking, wildly-rich, anti-political Mr. Fix It is attracting a bunch of regular folks who are fed up with the current Administration. At this point, Trump is almost impenetrable. He denigrated a beloved maverick. He read aloud a private cellphone number of a likable bachelor. He, perhaps most dramatically, racially profiled millions of America's workforce. And somehow each time, no matter how much the press has pushed him, he's managed to weasel his way out only to grow in the polls. It is fascinating. His bit about John McCain at The Family Leadership Summit was untrue, unwarranted, and wildly stupid and though it received, by far, the most media attention, it wasn't the the most remarkable part of that interview for me. I found myself entranced by his comments about faith. Most significantly, forgiveness. Bluntly, Trump was asked, "Have you ever asked God for forgiveness?" Trump answered it as Trump always does, as only he can. "That's a tough question. I don't think in terms of...I'm a religious person, shockingly...I'm Protestant, I'm Presbyterian, I go to church and I love God and I love my church." He continued with a story about "the great" Norman Vincent Peale, a man he reveres and whose sermons made a lasting impression on him. Never, of course, answering the question, "Have you ever asked God for forgiveness?" I love this next part. The moderator didn't let it go. "But. Have you ever asked God for forgiveness?" The audience laughed. Trump responded, stumped. "I'm not sure I have. I just go and try and do a better job from there. I don't think so." He likely could not have been more honest. While later he rightly referred to taking the "wine and crackers" at communion as a way of asking for forgiveness, there was a certain attitude of humility and repentance that the moderator was looking for to which Trump, truthfully, could not admit. Maybe it's because Trump can't admit to wrongdoing; that certainly seems likely. Maybe it's because Trump thinks he's the greatest man to walk this earth; that seems possible. I can't help but point to his own admission: his pastor, to which he immediately made reference and shared exuberantly about his influence, may have shaped--or at least allowed--this mindset of Trump. To those familiar with recent American history and theological thought, the name Norman Vincent Peale isn't foreign. A controversial pastor after the release of his book, "The Power of Positive Thinking", Peale's teachings were shunned by both the mental health and theological communities being regarded by some as heretical. · Be kind to yourself"
Seems an odd set of goals from a Christian pastor, eh? It's a self-help book, sure, but its Christian message, if there even is one, leaves much to be desired. Wikipedia's entry on Peale quotes John Krumm(the book linked above), Reinhold Niebuhr, and G. Bromley Oxnam on Peale's anti-Christian espousing in his book. Wikipedia's choice of quotes from Liston Pope was my favorite though, "There is nothing humble or pious in the view this cult takes of God. God becomes sort of a master psychiatrist who will help you get out of your difficulties. The formulas and the constanat reiteration of such themes as "You and God can do anything" are very nearly blasphemous." ("The Case against Easy Religion," William Peters. Redbook Magazine, September 1955, pp. 22–23, 92-94). I mean, come on Dr. Pope, tell us how you really feel. Either Trump needed to name-drop to evade a question about his own brokenness or Norman Vincent Peale made a lasting impact on The Donald through his preaching. The evidence, Trump's refusal to admit to his need for forgiveness, points to the latter. If a preacher preaches that one can overcome the most difficult obstacles and accomplish anything simply by thinking positively about it, how can one be convinced of their own need for redemption and forgiveness? It doesn't take a political genius to realize that Trump's humility is lacking. I'm convinced, as a Christian minister, that humility and a self-awareness of one's own brokenness is essential to their discipleship. If one claims to be a Christian, as Donald does, one must be convinced of their own need for grace. Without it, there's no point in Jesus. The problem? GOP voters have already proven in large part that politicians speak louder in their hearts than their pastors do and conservative pastors continually shape the work of their sermons and their reading of Scripture within the political atmosphere. I fear that an influential presidential candidate might renew a sense in America's Christians that one's own humility is not necessary for the gospel. That is a lie. That is a problem. Posted in America, The Church, Current Events and tagged with Family Leadership Summit, Vote, Republican, GOP, life of faith, Norman Vincent Peale, church, Christ, Christian, Jesus, Donald Trump, 2016, President, Faith. July 26, 2015 by Bryant Manning. Jonathan Aigner, a UMC music director and worship blogger, took on a reader recently. Quoting his reader, the anonymous "Glenn", Aigner fires back on Glenn's accusation that Aigner often unfairly takes shots at Chris Tomlin, one of America's modern leaders of music in worship. Aigner often has a lot of smart things to say, particularly about theology in worship. That's convenient because that's literally the URL of his site. Though I respect much of Aigner's work, I feel as if this time Aigner missed the mark. In what I can only imagine is a defensive work so as to continue his personal vendetta against Tomlin, Aigner inaccurately describes Tomlin's music, blindly points out the speck in Tomlin's eye, and in the process secures his readership in their own personal dislike of the modern worship scene. Aigner organizes his thoughts by way of several key aspects of Tomlin's music. I'll do the same here. I've many times over been led in singing by Chris Tomlin and those he's raised up as new leaders and songwriters. I also consider myself to be a student of the worship artists who are writing new music for the church. I, as a seminary graduate and music leader myself, think often about what I call the "sing-ability" of the music we lead with. I'd argue that Tomlin's music is often melodically and rhythmically simpler than almost every other mainstream worship writer. My argument might even consider the fact that his music has caught on more than others' precisely because of this. Aigner doesn't use this argument, though. His assertion centers on the fact that Tomlin's Amazing Grace (My Chains Are Gone) hits a "high G" in its refrain. That's factually inaccurate. Tomlin's refrain, one he tagged onto the beloved hymn, makes use of a high F, a whole step down from the G to which Aigner is referring. Most basses are going to drop the melody down an octave anyway. Most altos are going to sing it in octaval unison with the tenors (Tomlin, for instance) and the sopranos will sing it just as normal. A G above middle C is unattainable for most baritones, relatively high for most tenors and sopranos, and right in line with with altos. An F (the actual pitch Tomlin sings) is a more agreeable pitch simply because it finds itself below most sopranos' and tenors' passaggios, reachable for baritones, and again in line with an alto melody. I'd criticize Tomlin for writing a G too. But he didn't write a G. He wrote an F.
Aigner also references the problem of the "solo" worship leader. He remarks that Tomlin's vocal stylings do not allow for congregational singing, instead presenting the congregation with the opportunity to merely sing along. It's true that our modern worship culture doesn't see anything wrong with worshipful singing being described as singing along, but to attribute this solely to Tomlin is unfair. To critique this on the basis of Tomlin's musicality alone is worse yet. Tomlin's (worth noting that Louie Giglio is also given songwriting attribution here) obvious intention here is to metaphorically draw the connection between never-ending rain and God's never-ending mercy. Aigner suggests this is a weak metaphor but I've never heard of anyone using a water metaphor for God's mercy before. I, too, wish Tomlin hadn't used a destructive force of water to describe God's mercy. Criticize the guy on weak and strange metaphors, sure, but criticize him for quoting the psalmist? No. This isn't a fair critique at all. Here's a concession critics should make: songwriters are allowed to quote scripture and not be criticized for poor poetic skills. See above. I've heard the argument before that this line does not properly assign an object to the preposition whereas Paul does in his Romans text. That might be a fair assumption but, again, Tomlin wouldn't be the first hymn writer to stretch the English language to fit a rhyme scheme or rhythmic structure. I can only imagine Aigner's frustration with this line is its imperfect rhyme structure. Ok, sure. Or maybe it's the irony of "rising" by "falling on my knees". At the skin level, the latter critique seems humorous. I think there's something beautiful, though, about drawing the connection between humility before God and rising as Christ was risen. I'm with the high and mighty idea that those who write music for the church ought to do so for the good of the church and the church alone. Their work is kingdom building work and ought to be seen as such. But this celebrity-status isn't a new phenomenon. Do you think John Wesley wasn't a big deal? He famously learned to preach to the multitudes of people gathered from George Whitefield. American churches vowed to follow his every instructions(sort of). Isaac Watts trained pastor after pastor at his large church in London. Tomlin may be an overpaid worship superstar but he's certainly not the first and certainly won't be the last Christian celebrity. And whose fault is it really that Tomlin's presence has the gravitas it does? Tomlin's? Or is he simply trying to make the best music he can for a modern generation? Is it the nature of us, the people, that want to celebritize everything we come into contact with? Likely. And before you go on pointing to the "showy" nature of modern worship music as the reason for this, I'd like to point to this, a church organist competition (utilizing the playing of hymns) with a cash prize. So maybe, just maybe, let's step off that high horse for just a second. After all, a quick Google search of Jonathan Aigner's name returns a few professionally-shot-in-a-church promotional head shots. Speck, meet log. Aigner thinks it right and proper to criticize the work of the church so as to make it better. I'm with him. But these types of critiques of the modern worship world cannot be generalized, must be factually accurate, and ought to be approached with humility. It's only in that moment that we'll actually make any progress as a church and enable ourselves to speak to generations to come. Posted in Music, New Lessons I've Learned, The Church, Divinity School and tagged with Worship, Jonathan Aigner, Aigner, Contemporary worship music, Theology, traditional worship, UMC, United Methodist Church. February 19, 2015 by Bryant Manning. Each can originated in a small town of 4,000 people on the Murray River in Western Australia called Pinjarra. Pinjarra is the site of the world’s largest bauxite mine. Bauxite is surface mined — basically scraped and dug from the top of the ground. The bauxite is crushed and washed with hot sodium hydroxide, which separates it into aluminum hydroxide and waste material called red mud. The aluminum hydroxide is cooled, then heated to over a thousand degrees celsius in a kiln, where it becomes aluminum oxide, or alumina. I didn't understand a single word of this. Posted in Linked List and tagged with Coke. September 22, 2014 by Bryant Manning. BREAKING NEWS: Houston Astros Fan Lets Go of the Ball Too Late! Funny video of an Astros fan who evidently doesn't have a lot of throwing experience. Heard someone remark yesterday, "If you've never thrown a baseball before, why would you agree to throw out the first pitch?!" What's hard to realize and remember is that even if you have confidence in throwing a baseball, throwing one on a downward slope from the pitcher's mound is another thing entirely. This girl looks like she didn't have experience with either of those. Posted in Linked List and tagged with baseball, ESPN. August 27, 2014 by Bryant Manning. But the drone metaphor is a terrible and disturbing one. It trivializes the big questions about a scary new technology and equates God with a weapon of war. It'd be ok with me if this sort of stuff didn't come out of churches anymore. Posted in Linked List and tagged with Drones, God, Pastor, Church. August 26, 2014 by Bryant Manning. 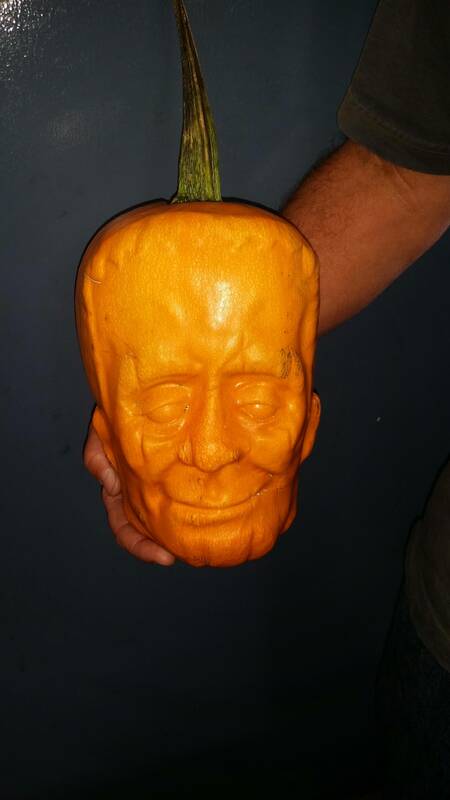 Grow a Pumpkin Inside a Plastic Mold. Nuhuh. That's amazing. This is going to revolutionize Halloween. "What is so deceptive about white privilege is that it is different from blatant racism or bias." Chandler said. A privileged person's heart may be free from racist thoughts or biased attitudes, but may still fail to see how the very privilege afforded to him or her shapes how he or she interprets and understands the situations and circumstances of people without privilege." My guess is that those sorts of sentiments aren't too popular among Matt Chandler's constituents. Posted in Linked List and tagged with The onion, Ferguson. A tachyonic antitelephone is a hypothetical device in theoretical physics that could be used to send signals into one's own past. Albert Einstein in 1907 presented a thought experiment of how faster-than-light signals can lead to a paradox of causality, which was described by Einstein and Arnold Sommerfeld in 1910 as a means "to telegraph into the past". Posted in Linked List and tagged with Physics. August 21, 2014 by Bryant Manning. John takes on the disaster in Missouri. Well done. Posted in Linked List and tagged with Ferguson, Police. iTunes Digital movie redemption is great. You open the app, navigate to the store, click on "Redeem" and redeem your legally purchased digital copy of your new favorite flick. One problem: all iTunes movies are digitally protected so that they will not play on an external monitor (including a home projector or secondary display) that is not connected via HDMI. There's no way for them to check the copyright. Thanks, Hollywood. No worries, though! My purchased BluRay comes with an UltraViolet redemption too! So, I log in with Flixster, my chosen UltraViolet redemption service. That's a whole thing because you actually have two logins: one for UltraViolet and one for Flixster. Nevertheless, I get logged in and attempt to redeem the code. It starts downloading. Great! It'll play on an external display. Great! Problem: it's downloading in SD quality. Less than 720p. At the same quality as a DVD. This is beneficial but on a home HD projector, it looks, well, bad. But why? Why wouldn't I have an HD copy? My physical copy is in 1080p. Certain studios, it seems, only authorize standard definition downloads for all redemptions, regardless of the quality physical media that is purchased. Piracy of digital media (mainly movies and television shows) may have been curbed *slightly* by the existence of digital redemption codes, but it hasn't come close to eradicating it. Nowhere close. What would have been an easier way to watch the film? Find it on an online streaming site, load it in the cache, and click "Full Screen". I didn't do that because I've begun to have a conscience about such things. I paid the price as I attempted to watch a film I paid for on an external display that I owned in my own dwelling. And why? All because my display used a different connection. If I buy an iTunes music file on Apple's service, there are no longer any digital restrictions on what I can do with the file. With it, and the existence of cheap legal streaming options, music piracy has been severely curbed. We're moving that way in film but it's taking far too long. Some say that film and music are different arts. This is true. Steve Jobs once famously said that no one wanted to rent music, they'd rather own it. Because you might want to watch a movie once or twice in your life, but you may want to listen to a song thousands of times. The music and movie industry are different business models and different arts. But their distribution methods are much much the same. Some say that the intention is to curb the unlawful presentation of films to large audiences. This isn't true. If I had an HDMI display, I could have played it easy peasy. Or, if I had chosen to play the physical media instead of the file-based media, I wouldn't have had a problem either. But, WHY WOULD I PUT A PHYSICAL DISK INTO A MACHINE? Yuck. What is this, 2005? Movies, and the consumption of them, is moving to a sans-physical distribution method. It needs to move quicker and reward those who purchase legal material. To do so, the business structure may need to change. It may change the prices we pay. But until then we'll fight. And cry. And be forced to watch our newly purchased film on an internet-connected television device. But we don't want that. Consumers want to watch what we want, when we want, and how we want. Sell that to consumers in a non-proprietary way, and you just might sell more films. Posted in New Lessons I've Learned and tagged with iTunes, divergent, Hollywood, Bluray, . August 8, 2014 by Bryant Manning. My post regarding Dave Ramsey's dismissiveness to me and the poor has blown up. I never expected such a response. I've had a welcome amount of agreement along with a surprising amount of "I've been there". It seems to me as if Dave and his team make a habit out of closing off disagree-ers by blocking them on social media platforms. As you can imagine, this is both comforting and frustrating for me. I shouldn't have put such a thing on social media to begin with (either the blog or the original tweet). Dave Ramsey is immensely generous because of his wealth and most churches turn to rich people first in order to accomplish their calling in helping the poor. Capitalism is not bad and has been proven to be far more successful than socialism in this world. I'll attempt to briefly address each critique. I think these critiques suffer from some presumptions that are American in nature and not, in my view, Christian in nature. I shouldn't have put such an argument on social media. This isn't the first time I've heard such and argument. That's ok. I think the world is still experimenting with what is appropriate in a social forum like the internet and those lines have been both defined and blurred throughout time. For all who say that this conversation is inappropriate to have on the internet, I've got a ton of people who say they appreciate reading this stuff via the same medium. It's both a win win and lose lose situation and as long as I'm willing to put up with the consequences, I'm ok riding that line. Anyone familiar with Dave Ramsey should be familiar with the amount of money he makes. He makes it clear within Financial Peace University that he's a multimillionaire and that he advocates giving as a part of being a financially peaceful. I'll go as far as to commend him for a line he often tells callers on his radio show: giving isn't about percentages or anything else, giving is about giving with a giving heart. Dave advocates giving, especially when you've developed wealth. But this is a fundamentally American view of wealth. After all, if there were no rich, who would support our moralistic endeavors? This is American in nature because it presumes free market capitalism and few Christian virtues. Funny enough, Dave presents this theory under the guise of scriptural authority in FPU. He quotes Proverbs 21 saying that wise people store up food and oil, fools gulp theirs down. You can only be of help to the world if you have money saved up. What type of scriptural authority is it though, if it ignores perhaps the most famous exchange about riches in Scripture? The gospel writers tell us that when a rich man was asking the very question of salvation (inheriting the Kingdom of God), Jesus quoted off some laws he must follow. When the man said that he had followed all those laws, Jesus introduced him to one more idea: sell everything you have and give the money to the poor. After that, he said, come follow me. I don't think Jesus is strictly saying here that you can't have money and be a Christian, but I do think he's making a point: you can't love your possessions more than following Jesus. Christianity does not function under the assumption that we need rich people. Christianity functions under a devotion to the lordship of Jesus Christ and nothing else. This is a fundamental difference between American views of wealth and Christian views of discipleship. My argument against capitalism isn't that it's unsuccessful. Financially speaking, capitalism makes more rich people. My argument is that socialism helps us equally value each and every member of society based on their worth as a human, not only off their work ethic or success in business. I don't think the United States could ever move to a socialistic form of government or economics (and I don't think Obama is moving in that direction--I think that's largely rhetoric), but as a Christian I can see how socialism mirrors the way God looks at all God's children. I can at least see the holiness in it. The US could not move to to socialistic values for precisely that reason: it values things Christianity does not. I greatly appreciate everyone's interest in my original post. I reiterate that I find Dave's general principles helpful but that his outlook and general despise for socialism for no other reason than love of money hurts his Christian witness. Posted in New Lessons I've Learned, The Church and tagged with financial peace university, twitter, Dave ramsey, capitalism. March 1, 2014 by Bryant Manning. SeaWorld is a world leader in animal rescue. The millions of people who visit our parks each year make possible SeaWorld’s world-renowned work in rescue, rehabilitation and release. We are constantly innovating when it comes to this care: Our veterinarians have created nursing bottles to hand-feed orphaned whales, prosthetics to save sea turtles, and a wetsuit to help injured manatees stay afloat during rehabilitation. Whether it’s the result of natural or man-made disasters, SeaWorld is always on call and often the first to be contacted. We have rescued more than 23,000 animals with the goal of treating and returning them to the wild. I've always supported SeaWorld, before I even knew of their quality work in conservation and rescue. I, the average non scientist Joe Scmoe, know more about marine life and have developed an affinity for such creatures because of SeaWorld's work. This, in my mind, is only one of SeaWorld's many successes. December 21, 2013 by Bryant Manning. I acknowledge that I do not have the authority to restore the ministerial credentials that Frank Schaefer has lost. Only a board of ordained ministry can recommend such a reinstatement of credentials, and only the ordained clergy of an annual conference can determine whether a person will be credentialed for ordained ministry. What I can do, however, is invite and welcome others to love and serve Christ Jesus among us, accompany those who choose to be faithful, and exhort us all to be biblically obedient. This I will do for as long as God gives me breath. Again, if you don't see a serious upheaval in either the way the UMC understands its own polity or the way in which it is structured, you're not paying attention. "That's Why I Ran For This Office"
Today President Obama gave his final press conference of the 2013 year. "If you're measuring this by polls, my polls have gone up and down a lot through the course of my career," Obama said. "If I was interested in polling, I wouldn't have run for president." "That is a big deal. That's why I ran for this office," Obama said. Keep your eyes on the prize, America. Believe it or not, people are saving money on health insurance. December 20, 2013 by Bryant Manning.